I've been working on a few aceo's (Art Card Editions and Originals) to offer while awaiting an opportunity to move forward with my 3 dimensional work. 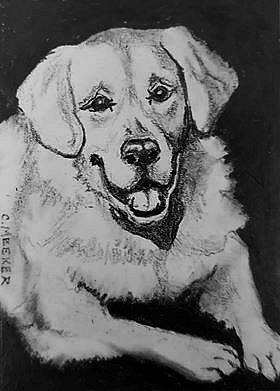 This one was inspired by Arlo, my own golden retriever. This is an original graphite pencil on 100lb heavyweight acid free paper. This would make a fun and affordable addition to your small works collection!